Hello Fellow Mathematicians . 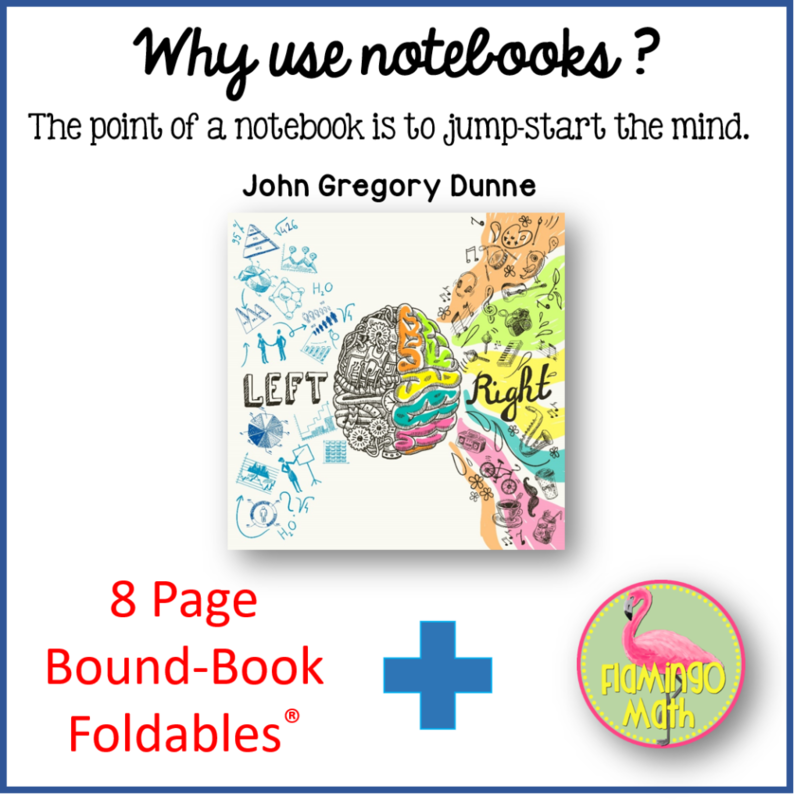 . .
Are you ready for some Interactive Student Notebook fun in the secondary classroom with my Bound-Book style Foldables™ ? We all know how our students struggle with organization in the math classroom. I fell in love with Dinah Zike’s Foldables in 2001, and have used them ever since to promote organization and ownership for Algebra 2 and PreCalculus students. Why not use paperless notes? With the ever-expanding interest in one-to-one classrooms and improving technology, I’m still not willing to go totally paperless. Foldables are graphic organizers that help students organize information and represent abstract ideas in a concrete manner. My students like variety and we integrate technology every week, but note-taking is still done with paper and pencil. I appreciate the article by Ellie Bothwell, “Pen and Paper Beats Computers for Retaining Knowledge” which describes the retention of concepts in a study of university students from 10 countries. While digital learning is here to stay, I find a happier balance with some pencil and paper learning for a personal journal of knowledge in my class. their experience. Students find ownership in the process. It can benefit your students, as well. 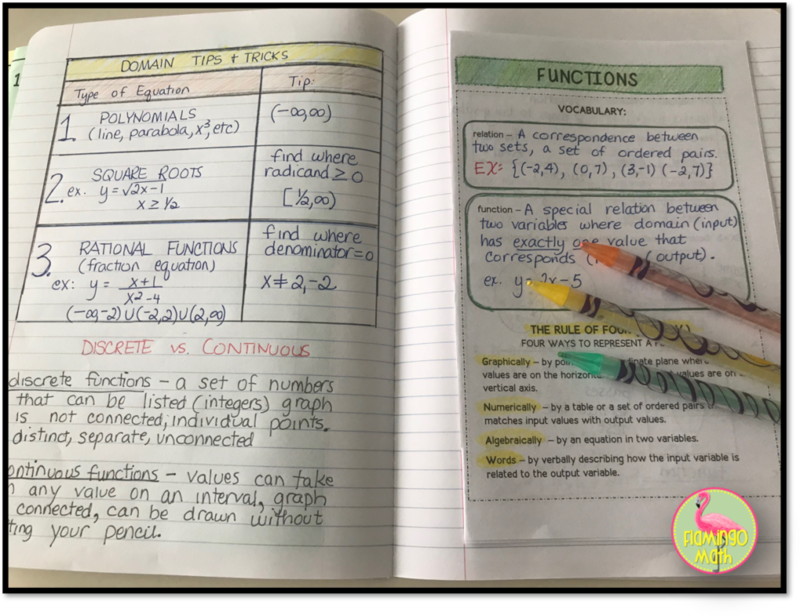 Why use Interactive Student Notebooks? You need to have a clear idea and plan for what you want students to keep in their notebooks. With just a little bit of thoughtful pre-planning on your part, things will begin to take shape. Let me share a few personal insights from my journey with interactive notebooks. 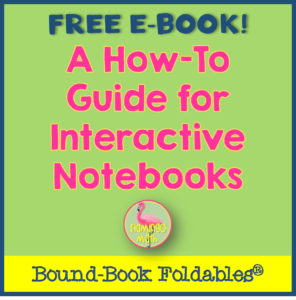 In fact, I wrote a FREE E-Book “A How To Guide for Interactive Notebooks“ that you can get from my TPT Store. I find that taking an entire class period to personalize the journal brings a great amount of “buy in” from the most reluctant students. I like to bring scrapbooking paper, scissors, clear packing tape, markers, glue, and labels. I want them to know and be aware of their Personal Math Goals for Success. Keeping each unit sub-divided with Unit Labels and a Big Pocket for storage is helpful. I like to provide my learners with the Objectives and Learning Goals that can fit neatly into the design of the book. Maybe the biggest thing that I have learned in over 15 years of using Interactive Student Notebooks in a secondary setting is that I DO NOT GRADE STUDENT INTERACTIVE NOTEBOOKS. It took me several years to realize this fact was holding back creativity. I can always find time to talk with students about their growth in class and how their journal is helping them master the concepts. It’s like a brainstorming session where you can offer helpful suggestions or ask insightful questions to help them grow in their knowledge about how their individual brain processes information. Here’s a look inside my Teacher Notebook for what we did in our first Functions lesson in PreCalculus. Students were confused on domain and range with several parent functions after the lesson and homework was assigned. So, the left side of their notebook was used to create some personal notes for tips and tricks. Grab my Free E-Book Now! 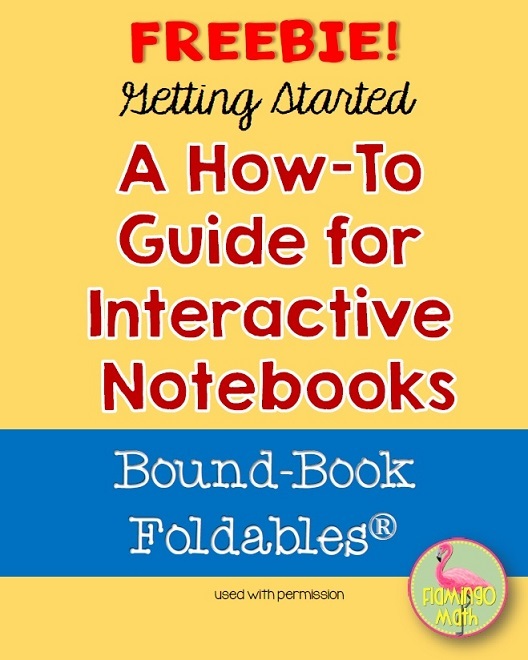 If you’re ready to jump into the Interactive Student Notebooking journey, let me help you get a jump start. I’ve created the Algebra 2 INB tabs for Expressions, Equations, and Inequalities and the PreCalculus INB Tabs for Functions and Graphs to get you started. If you already own one of my unit bundles, be sure to check your downloads for these newest items as I upgrade my products this fall.